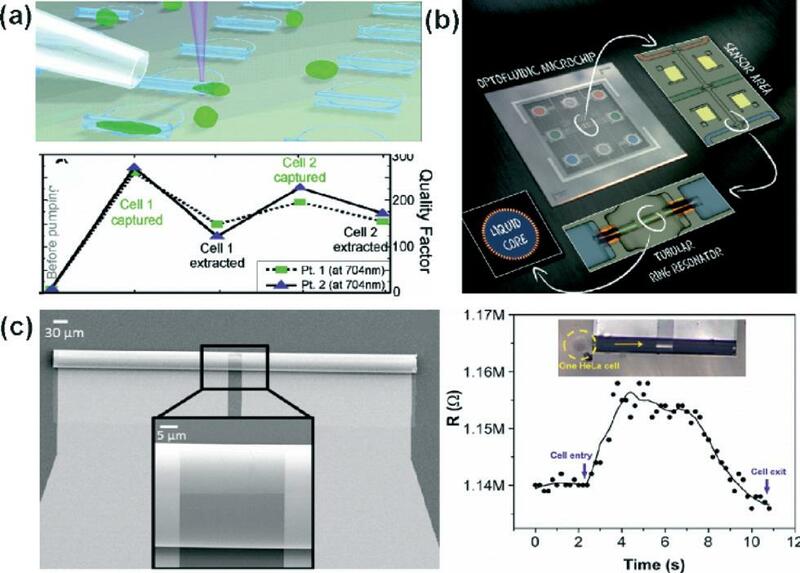 Take a look at our Lab on a Chip 2014 HOT Articles Collection! *Access is free until 23.01.15 through a publishing personal account. It’s quick, easy and free to register! The use of microfluidics to test the safety of drinking water is growing increasingly. Although several microfluidic concepts are already shown to detect pathogens in water useful for this industry, the authors of this article focus on the use of such a device for a different audience: young children. They show that it can be perfectly used as an educational tool to make children more aware of the importance of clean water and the advantages of microfluidics. In total six modules are developed, each of them having own teaching objectives and materials. 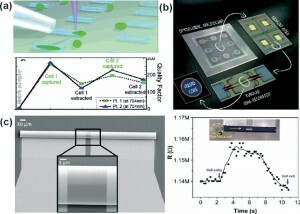 The modules can be used separately and both standardized techniques as well as new microfluidic techniques are treated. 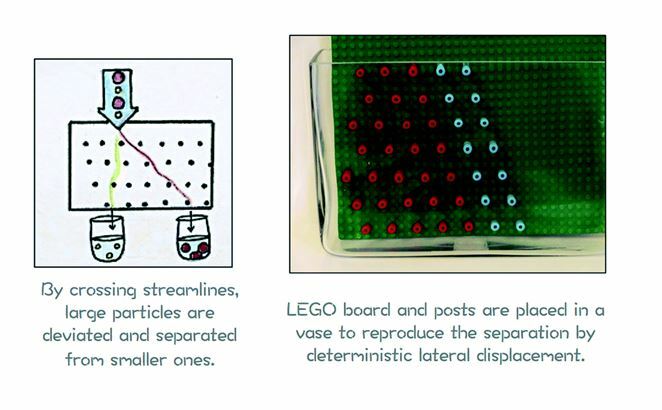 For instance the use of the microfluidic separation technique deterministic lateral displacement to separate pathogens out of the water is visualized on a macroscale using LEGO® and particles made with FIMO® clay. The good particles are smaller in diameter than the bad ones, making separation in on macroscale using viscous media (in this case shower gel) possible. A complete activity is made by the authors, that shows a new and original approach to make young children aware of the challenges in science, technology, engineering and mathematics. 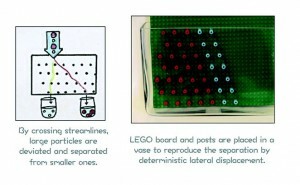 By using simple components in combination with cartoons and descriptions, the child can remove the bad pathogens from drinking water in about 30 minutes. For more information, download the full article now – access is free* for a limited time only! * Access is free through a registered RSC account until 23rd January 2015. Dr Loes Segerink is an Assistant Professor in the BIOS Lab-on-a-Chip Group at the University of Twente. Read more about her research interests on her homepage. Throughout a series of Lab on a Chip Focus Articles Samuel Sánchez, research group leader at Max Planck Institute for Intelligent Systems and recently elected as “innovator of the year 2014”, will be highlighting cutting-edge reports based on miniaturized devices that bridge functional materials and bio-related applications. And first up we have…Lab-in-a-Tube! Lab-on-a-chip already scales down several components and integrates them into one device, but now scientists are working toward shrinking this further to develop entire laboratories inside an ultra-compact architecture such as a small tube. Samuel discusses the concept and advantages of the lab-in-a-tube before highlighting remarkable cell studies that have already been performed using microtubes. Lab-in-a-tube systems can combine several functionalities such as optical or electrochemical sensing and is therefore used in various detection systems. Samuel describes the developments in this area, leading to the fabrication of a highly sensitive rolled-up optofluidic ring resonator – fully integrated into lab-on-a-chip devices of course! Finally, Samuel discusses the challenges of controlling fluid flow at the micro scale and the use of self-powered on-chip micropumps. As one of Samuel’s main interests, catalytic micropumps will be discussed further in an upcoming Focus Article. Samuel’s full article ‘Lab-in-a-tube systems as ultra-compact devices’ can be downloaded for free* on our website. We hope you enjoy reading his summary of recent advances in this new and exciting concept of chip integration. Don’t miss Samuel’s next focus article – register for our e-alerts now! *Access is free through a publishing personal account. It’s quick, easy and free to register. Samuel earned his PhD in Analytical Chemistry from the Autonomous University of Barcelona in 2008. After a short period as an Assistant Professor, he worked in Japan at the National Institute for Materials Science. In 2010 he moved to the Institute for Integrative Nanoscience at the Leibniz Institute in Dresden where he was leading the “Biochemical Nanomembranes” group. He is now leading the independent research group at the Max Planck Institute for Intelligent Systems. Samuel has received several awards for his work including the Guinness World Record® for “The smallest man-made jet engine” in 2010, the IIN-IFW Research Prize 2011, the ERC-Starting Grant 2012 “Lab-in-a-tube and Nanorobotic Biosensors (LT-NRBS).” Recently, Samuel has been named as Spain’s top innovators under 35 by the Spanish edition of the journal MIT Technology Review. *Access is free until 5.01.14 through a publishing personal account. It’s quick, easy and free to register! You are currently browsing the Lab on a Chip Blog blog archives for December, 2014.